So, hey! It’s getting to be that time of year again – time to start planning your pilgrimage to Colorado to hang with us and other like-minded tech nerds for the 10th annual SparkFun AVC! Yep, 10 years have passed since starting this shindig, and it continues to be one of our most anticipated events, inside the building as well as out. Today we’re going to post the rules for SparkFun AVC 2018 (subject to some amount of tweaking between now and the event), and I’ll spend a little time here to tell you where we’re at with all of this. 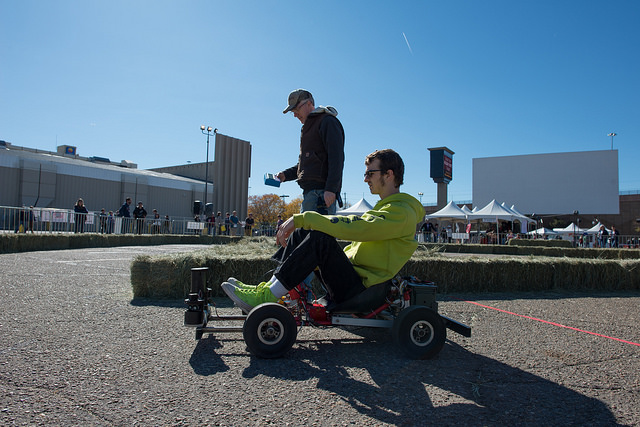 At SparkFun, you don’t drive car, car drives you! To piggyback on some of what Megan said in her blog post last week, this year the event happens 9/7-9/9/18, and it’s at the Boulder County Fairgrounds. 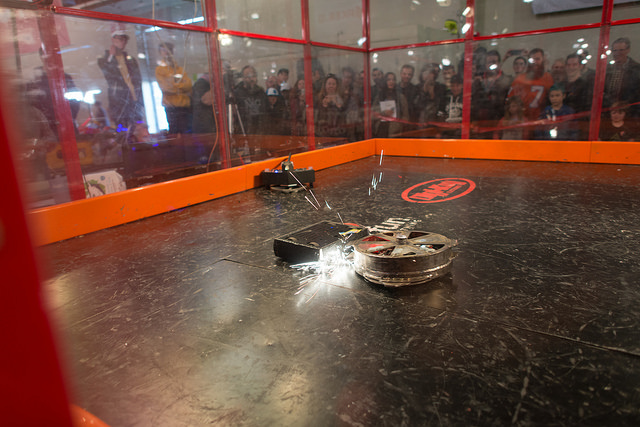 Like last year, there will be two pieces to the event: Combat Bots and Classic AVC. And each of those have subcategories: weight classes for Combat Bots, Speed Demons and Autonomous Car Wars for Classic AVC. So, same sort of thing as last year… except we’re (almost certainly) not running Logistics Class within the scope of Classic AVC. What?? No Logistics Class? Well… while we think the competition has merit, we only had one competitor last year. It was a hard task to be sure, but one competitor doesn’t make for much competition, does it? That said, it’s not yet completely off the table. If you’ve got an interest in running Logistics, drop us a note at avc@sparkfun.com, or post a comment here, and we’ll make the final call in the near future. The track for Classic AVC is going to be a figure-eight with the same dimensions as last year. Why? Because it was hard, and that sorta surprised us. We don’t like to keep doing the same old easy stuff; we want to be continually challenging your abilities with this competition. But clearly, mastery of the figure-eight has not been achieved. It’s also going to be on hard-packed dirt, and there are a few scattered rocks (like small gravel), so plan your chassis accordingly. Will rain be an issue? Well, we walked the track on a wet day, and it looked passable to us. Most of the obstacles for Speed Demons will remain the same, with the exception of the James T. Kirk slow-moving pedestrian. Jim was just too high-maintenance, so he’s being retired, but we will almost certainly add another obstacle or two that will test your abilities. More on that in the future. Roboteers! Get ready to register! We will be using a subset of the www.Sparc.tools ruleset. We have included our selection of the rules to hopefully make things a little simpler to follow. This year we are making some additions, along with some changes. Starting with the Plastic Ant weights (1 Lb), we are making this exclusively K-12. This is a great weight class to get started building robots. Using 3D-printed materials to create the body and weapons lets teams build robots with tools they might find in their schools and libraries. K-12 teams are welcome to enter other divisions but we will be focusing special awards on the Plastic Ants. 1, 3, 12, and 30-lb bots are going to run the same as last year. If you have one, great! If not, start building after you take a look at the rules. I know one of the burning questions this year is if we will have flame throwers. To that I say, yes…for now. If you plan on building one, please reach out to us. We will need to qualify each flame thrower individually, and I have some extra safety steps we need to take. We had a great showing last year and I hope we can grow the event. NEW DIVISION! Woot! The community reached out to us and we listened! We are going to add 60-lb non-spinners this year. What does that mean? Well, I would love to bring on the full combat, but I’m not sure the arena can contain the chaos just yet. Any robot that doesn’t spin a large mass continuously is good to go. If you have been wanting to build a bigger bot and you miss the days of Golden Eye 007 “Slappers,” this will be the competition for you. Let’s see your hammers, flippers, grabbers, lifters and ok, wedges. Any robot designed to slap will forever win my respect and the best slapper will get an additional prize from my box of misfit robot parts. We are also going to change how the event is run this year. The livestream has been a hit year after year, so we are going to adjust the event schedule so our fans near and far can tune in and follow along. To support the livestream we are asking teams to check in and complete tech inspection on Friday. I’ll be there all night if I need to; we want to collect some interviews and get footage of your robots in action. This event is going to be just as much about competing as it is sharing what you have built with our viewers. As I mentioned, it’s all going down 9/7-9/9. As for the specific timing of the events, we’re still working out the details. The way it’s shaping up right now is that 9/7 is going to be a set up and practice day for both combat bots and AVC vehicles. Combat bots will run both 9/8 and 9/9. Classic AVC may just run on 9/8, depending on whether we end up doing Logistics. Last, as this is the 10th year of AVC, we want to reaffirm this event as one where the focus for us is on the competitors, not the crowd. No silly distractions, just bots from dawn ‘til dusk. We’ll have the competitor party, of course, plus some other surprises. Stay tuned for more details, and check out the AVC page for current rules! I agree with @Joel_Q. The logistics class was something my University's club was looking into competing in. The ability to have multiple people working on different tasks provides the perfect scenario for a club to work on. Hopefully there is still a chance to bring it back! I think @Joel_Q is right, the logistics class would be awesome. I was actually really hoping to work on it. I think the logistics class provides a unique opportunity to really hammer down on exciting autonomy. I think it would be pretty cool to see a robot whose software is based off of some form of deep learning. I don't think that Logistics was autonomous. At least from what I saw last it was just RC robotics. I would also love to see the Logistics class come back! I'd sure like to see the Power Racing Series come back to Colorado. My family really enjoyed the racing two years ago. We did convert one of our vehicles for the Autonomous Car Wars competition (photo in today's SF blog), but we miss the head-to-head high speed racing and general chaos of the PRS. Any chance that Sparkfun could sponsor a return of the PRS? My understanding is that scheduling conflicts prevented them from participating last year, and I'm unaware of anything official past that. Anything's possible, but I don't think it's in the cards for this year. That said, if you wanna put a full-manual option on your autonomous car, we'll look the other way if you wanna take a few laps making "vroom-vroom" noises. Heck, I'll do it with you! Sounds good Pete! We'll bring two cars! Maybe we can work on the return of a Sparkfun sponsored PRS race as part of the AVC in 2019? I've never been to this event, but I have been thinking about it. Will wedges be allowed in the 60 pound class? Is there some sort of active weapon rule in the 30lb weight class or that just for sportsmen? Wedges are allowed in the 60# weight class. We don't have active weapon rules for any class. Just a thought on the rules for the Autonomous Car Wars: maybe some how start with a full "cup of coffee", and have the driver DRINK a portion of it (without spillage) -- maybe bonus points for it? Re: drinking the coffee, it's really less about the beverage itself and more about occupying a hand. And I'd hate to have to chase somebody around the course just to see if they got a drink from their cup. Can you explain, or point to a link, which explains the different classes in more detail for the people who don't know what the acronyms mean. i.e. what is a logistics class?